On hot and humid days, people long to escape, envisioning themselves walking on sand wet from the waves of the ocean rolling in to the shore. One fleeting thought of the ocean is all it takes to plant the desire to see whales throwing their bodies out of the water in a magnificent display of power. These grand creatures that wander far and wide throughout the ocean often gathered in Ulsan. The enjoyment of the deep blue of the ocean will also pull you to Ulsan. Even if whales are not spotted here daily, the ocean in Ulsan is still known for these grand rulers of the waters. 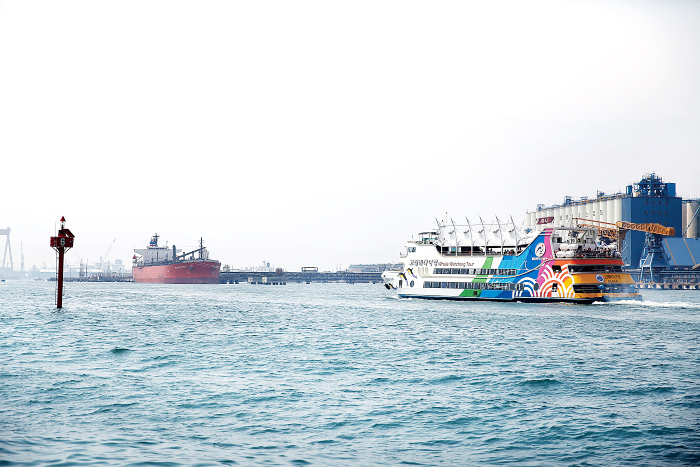 The first place to visit after arriving in Ulsan is Jangsaengpo Harbor. The Jangsaengpo Whale Watching Cruise departs from this port, allowing visitors the chance to look for whales. With a lot of time between the ticket purchase and the cruise departure, you can spend your time at the Jangsaengpo Whale Museum, located just next door. As the name suggests, the museum exhibits a vast assortment of materials and information related to whales. Of the 280-plus exhibit items, the grandest include the complete skeletal structure of a Bryde’s Whale, reaching a length of 12.4 meters and weighing in at 14.6 tons, along with whale baleens & jawbones, as well as the large vats used in the past to collect whale oil and the strong ropes used to hold the whales up. Displays of photographs from the past allow one to see Jangsaengpo Harbor as it was and how it earned its reputation as a place for catching whales. Up until just 30 years ago, it was easy to see over 50 whaling ships coming in and out of the harbor. However, the prohibition of whale hunting in 1986 quickly put a stop to this activity. The keep the history of the city alive, the Jangsaengpo Whale Museum was opened in 2005 and Jangsaengpo was designated a special whale culture zone in 2008. From the museum, you can easily walk to the Jangsaengpo Whale Life Experience Museum. The experience museum holds the first aquarium in the nation to house dolphins. Meet a lively family of dolphins as they swim over and around you in the 11 meter-long underwater tunnel. To get an even closer look at the dolphins, be sure to visit during the feeding hour. Four times daily (11:00, 13:00, 15:00, 17:00, closed Mondays), the trainers enter the aquarium tank to feed the dolphins, offering a chance to see the dolphins show off their cute tricks. However, to protect the animals, the number of visitors for each feeding is limited to 100 people in a first-come, first-served basis, so it’s a good idea to hurry here if you don’t want to miss out. After the museums, head to the harbor to set out to meet dolphins on the Jangsaengpo Whale Watching Cruise. It’s hard to keep your heart from racing when you think about meeting real wild dolphins. The cruise sets out east of Ulgi Light House and returns after three hours at sea. The course is set but if any whales or dolphins are seen, the boat will turn directions to offer the best views. Of course, there is no guarantee you will see any of these fantastic beasts while on the boat. However, the captain of the boat says the chances of seeing the animals increases greatly when the water temperature is higher, as they come in search of food. Last year, whale herds were spotted from the cruise at a rate of three out of ten times. Part anticipation and part anxiety, you can wait and wait and wait; in the end, it’s possible to see no whales. You can’t blame the whales, as you know they make no promise to show their faces. Despite the chances of not seeing whales, the three hour boat ride keeps you entertained. You’ll want to take photo after photo of the unique landscape created by Ulsandaegyo Bridge and the shipyard, and the dynamic performances on the cruise provide an atmosphere not unlike a festival. While the cruise is lively without seeing whales, you can’t help but feel a moment of regret if they aren’t spotted. Many visitors disembark from the ferry with the desire to board the ship just one more time in the hopes of better luck. However, you must move on, and there is nowhere better to head than to the Whale Culture Village. A fairly new tourist attraction that is heating up, your disappointment will begin to dissipate by the second. Opened in May of this year, the Whale Culture Village is the only whale themed park in the nation. Located a mere 10-minute walk from Jangsaengpo Whale Museum and Jangsaengpo Whale Life Experience Museum, the village is worth checking out. Whale Culture Village is divided into various areas, including “Old Jangsaengpo Village,” “Whale Statue Park,” “Whale Plaza,” “Prehistoric Whale Experience Garden,” “A Path to Meet Whales,” and more. The first place to catch your eye is the old village designed after a neighborhood from the 1960-70s. The village displays the guesthouse where the American naturalist and explorer Andrews stayed while studying whales, as well as the houses of captains and hunters, a whale butchery shop and whale fat rendering shop among others for a total of 23 buildings. The remaining buildings include a country school, library, small goods store, ironworks, charcoal briquette store and more to bring the old atmosphere of the town streets to life, with the old items and sentimental buildings stopping your footsteps. After touring the old village, head to the statue park next to Whale Plaza. From the peak of the park, you can see all of Jangsaengpo spread out below you. The park is populated with life-sized statues of various whale species, ranging from the large gray whale, humpback whale and sperm whale to the smaller minke whale and the ever-popular orca. The most magnificent of all statues, however, is the blue whale with his mouth open wide at the entrance. With a length of 20 meters, entering the whale will make you feel like Pinocchio. The trail through the theme park will naturally guide you to the Prehistoric Whale Experience Garden. Visitors can learn many things about prehistoric life in the Ulsan area through the wall paintings of whale hunts and the houses made from whale bones. The photo zone, A Path to Meet Whales, rounds out the trip to the Whale Culture Village. Without noticing, the sun can easily set while you are enjoying a full day devoted to whales. 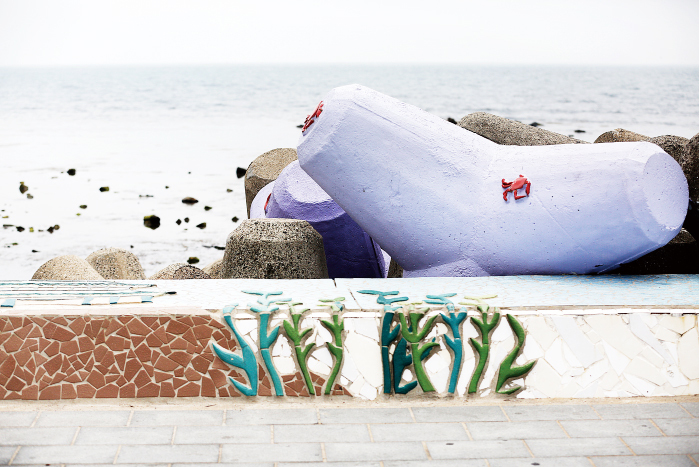 Of Ulsan’s 12 representative landscapes, one of these is the pebbly beaches of Gang-dong and Jujeon-dong. A poet from Ulsan once wrote “The sound of heaven is heard in the waves hitting pebbles, ranging in size from the smallest bean to the size of a child’s fist.” After hearing this, it’s hard to resist the urge to visit a pebble beach yourself to experience it. However, while Gang-dong and Jujeon-dong are famed for their beaches, there is no need to travel so far from the city. The name Seuldo has a deep connection with the holes in the stones here. ‘Seul’ is the Hanja character for the traditional Korean stringed instrument geomungo; the sound of the water rushing in and out of the holes creates a sound not unlike the plucking of the strings on the geomungo. The people of Ulsan have a word for this exact sound, calling it “Seungdo-myeongpa,” meaning the ‘Sound of Geomungo Island’s Waves.’ The island is also one of Bangeojin’s 12 most beautiful sights. The island is connected to Bangeojinhang Harbor by a line of breakwaters, so it is easy to walk there. At one section the path continues over Seuldogyo Bridge instead of the breakwaters; stop here to watch the seawaters swirling back and forth with the tide. At the mid-point of the bridge, take photos with the 11 meter-tall whale statue. This whale statue was designed after the motif of a whale at Bangudae Petroglyphs, National Treasure No. 285 located further north along the Taehwagang River. It only takes about 10 minutes to walk along the breakwater to reach the entrance to Seuldo Island, but stopping to take photos and enjoy the people fishing off the bridge can easily increase the time up to one hour. Climb up the stairs of the island to reach the first sight, a white lighthouse. Built in the 1950s, this unmanned lighthouse serves as a strong watchman, standing tall over the island. Installed along the lighthouse are speakers, softly playing a melody on geomungo, blending in with the sounds of the waves. 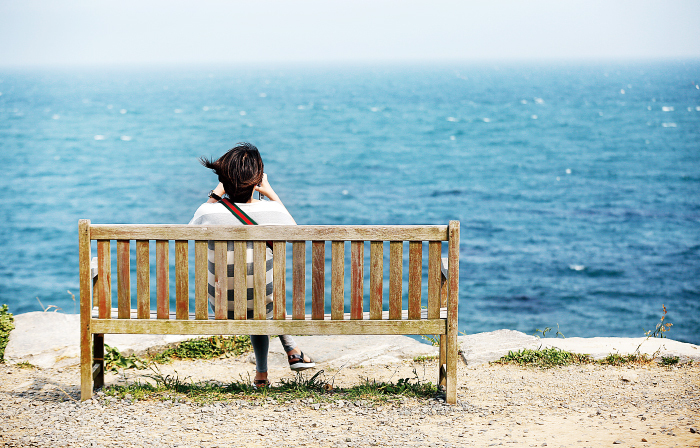 The island’s ocean-side is dotted with benches to take in the unobstructed view. They seem to be calling you to come and listen to the song of the ocean. Select one of the benches to the left for a calm and quiet time of relaxation. Without noticing, the crashing sounds of the waves will lull you into a meditative state. Close your eyes and simply take in the music playing all around you. Is it coming from the speakers, or is it the natural melody playing out at your feet? It’s easy to feel you will fly away with the wind blowing in off the ocean. The combination of the winds, the sound of the waves crashing to shore, and the salty smell in the air are the perfect mix to truly feel the ocean, perhaps for the first time in your life. Unexpectedly, the thought comes to mind that the waves in turn move whales away and bring them near. Even now, a time is coming in which we must part with these creatures of the deep. Visiting Ulsan truly opens ones’ eyes to this reality. As the white whale statue on Seuldogyo Bridge stands tall, we also must stand up to protect the whales. * The article is edited from the original Korean article. * This column was last updated in June 2016, and therefore information may differ from what is presented here. We advise you to check the official website before visiting.